On the lighter side of things. “Frame-arms girls” are an actual thing — they’re Figma-type figurines that stand there wielding various plastic weaponry (usually, these weapons are as large, or larger, than the doll holding them). But, it’s the Anime based on these figurines that I’m covering here. This show stars “Gourai,” a Frame-arms girl capable of wielding almost any weapon she gets her hands on. She is delivered to the residence of a ditsy teenager named Ao — her father is a higher-up in the company that manufactures these figurines like Gourai. She unboxes Gourai, somehow activates the girl, and from there a whole lot of interesting stuff happens. While the girls are sometimes hard for Ao to handle, in the end she doesn’t care because their virtual battles are making her money. For those who like slice-of-life Anime, this show has a lot of that. For those who like magical-girl Anime, this show technically has a lot of that as well. It’s a fairly good time all-round, regardless. Welcome to the anime series with more word-play than you can shake a stick at…. Literally. There’s more word-play in “Kill la Kill” than there is blood-soaked action. 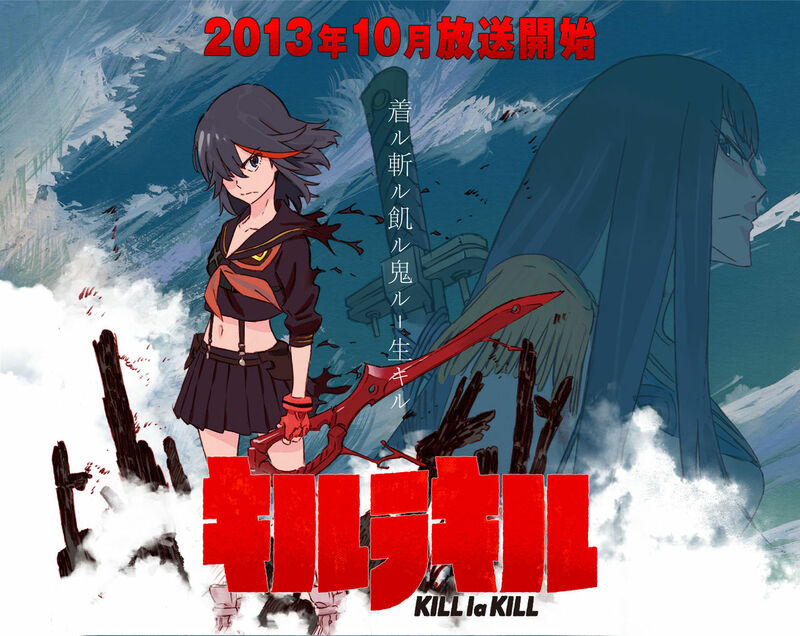 The best place to start is with the name itself – “Kill la Kill.” In the Hiragana/Katakana, “Kill la Kill” becomes Kiru ra Kiru; Kiru has two significant meanings: “to kill,” apt for the show, and “to clothe,” which also fits the show. Though, as you can see, the word-play, etc., is in Japanese; translating it all into English, all that double-meaning and what-not gets lost. For me, watching “Kill la Kill” was a lot like listening to a David Icke talk – particularly the latter half of the series. Alien beings that parasitically draw energy from living things until nothing remains, and then they move onto the next world… – sound familiar? When it didn’t feel like a David Icke talk, it felt like “Gurren Lagann’s” younger sister anime-wise. This makes sense, since “Gurren Lagann” and “Kill la Kill” were made, for the most part, by the same people; that’s probably why I enjoyed “Kill la Kill,” overall, so much. The next post I get around to making won’t be coming til March, now….